Fishing in Cuba is a unique opportunity. The Caribbean Sea currents bring along highly prized game fish such as white marlin and swordfish. Coral reefs, which provide shelter for several fish species, are abundant in the geographic platform where our island is located. The farther the platform goes into the ocean, the greater the number of fish that inhabit there. Deep down in the sea you can find swordfish and snappers. Those who love go fishing are always amazed at the incredible amount of shrimps, lobsters, crabs and marine life in general that can be found in Cuban waters. 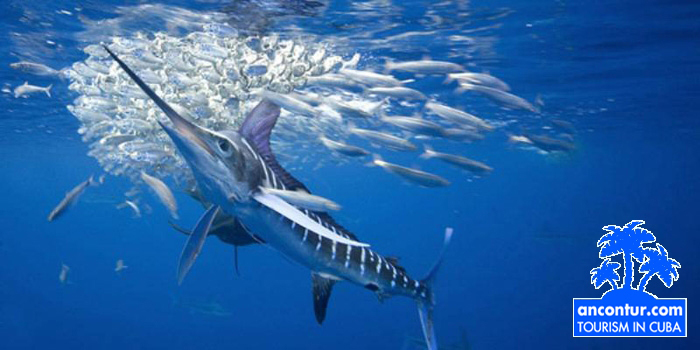 White Marlin can reach up to 3 meters in length (usually it does not exceed 2 meters) and can weight more than 40 Kg. Tuna usually makes excellent bait for white marlin. The perfect hours for catching white marlin are from 10:00 to 15:00. From April to May it is very easy to find white marlin along the south-western region of the island, and by the end of May, it can be found along the north-eastern region of the country. During April, when white marlin starts migrating to the west, it can also be found along the south-western region of Cuba. Atlantic blue marlin or blue marlin can grow to reach approximately 4 meters in length and 450 Kg in weight. Blue marlin feeds most of the day and is always very close to the water surface. The best hours for catching blue marlin are from 5:00 am to 11:00 am. It is very easy to catch by using artificial flies; however, most fishermen prefer using sardines and other minor fish, which make excellent bait for blue marlin. From July to September along the north-western coasts of Cuba. From March to June along the south-eastern Cuban coasts, and from April to June, along the south-western coasts. Although a specimen of 3 meters in length was once caught, needlefish dimensions are about 1, 5 meters (50 inches) and approximately 20 Kg (44 pounds) in weight. This fish is easier to catch with a natural bait and sardines are most frequently used. 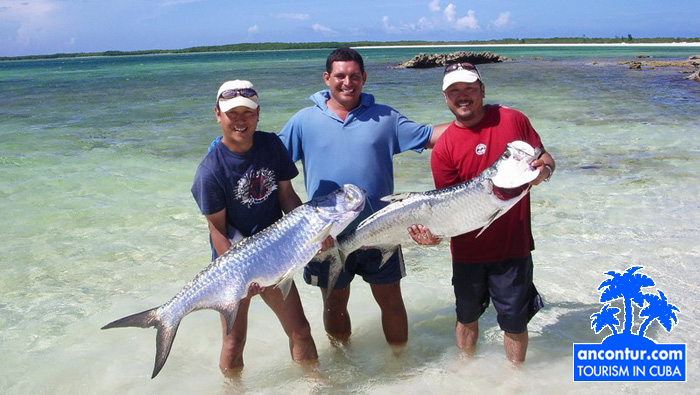 Perfect time for fishing a needlefish: From 9:00 am to 14:00 pm. From October to November along the north-western region of the island. From March to June along the south-eastern region, and from April to June along the south-westernmost point of the country. Swordfish can reach 4, 5 meters in length and more than 450 kg in weight. Fishermen usually find swordfish of 2, 5 meters in length and 125 kg in weight. Squids are commonly used as bait, although fishermen also use artificial flies with glowing lights. As most fish species, in a specific period of the year swordfish migrates to coastal areas, therefore, the best time in the year for catching it is the period from February to March along the north-western region of the island. The most favorable season for catching swordfish is between spring and summer. There is always good weather during this time of the year. 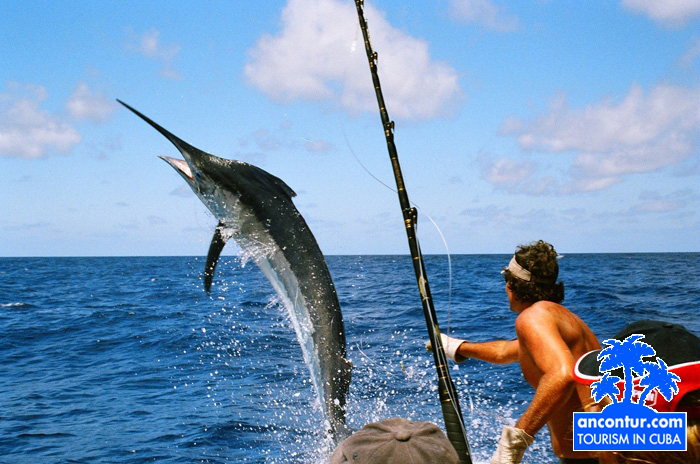 For example: flying marlin is relatively easy to catch in the north-eastern coasts of Cuba during October and November, when the probability of cold fronts is very low. The tribe Thunnini includes large and small tuna fish, wahoo, among others. Atlantic bluefin tuna (Thunnus thynnus). Length: More than 3 meters. Weight: 600kg. Bigeye tuna (Thunnus obesus). Length: 2 meters. Weight: 250kg. Among the most common species are included: Albacore (Thunnus alalunga) and Blackfin tuna (Thunnus atlanticus). King mackerel, (Scomberomorus cavalla) Length: 1, 5 meters. Weight: 15 kg. Wahoo (Acanthocybium Solandri) Length: 2 meters. Weight: 40kg. Larger tunas migrate from June to October in the area of Havana. Smaller tunas migrate in different periods of the year. For example, anglers can find Wahoo alongside the Cuban coasts from September to February. Besides tuna, anglers and fishermen can catch more than 15 fish species, among them: bonefish, permits, snooks, barracuda, blacknose shark, groupers, snappers and tarpons. Fishing prices in other marinas are available upon request. 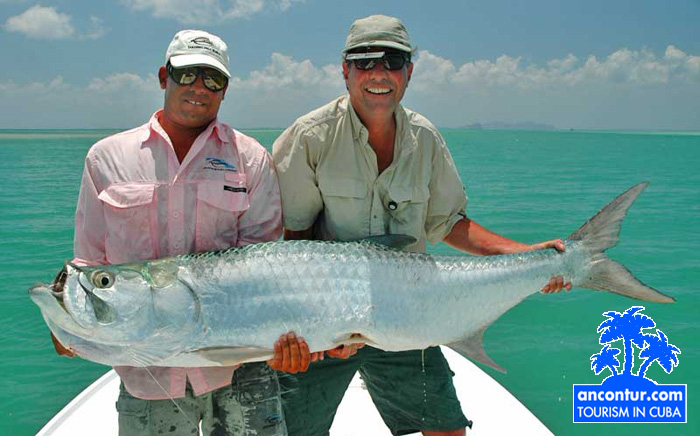 Travel agency "Ancon" can help you arrange fishing tours of different difficulty levels.